Can you make an interesting discovery...or two? The triangle below is similar to the previous triangle. You can move the points and view how the measures of the interior angles change. Now, let's play with exterior angles. 1) Click on the line tool (3rd square) and choose "Ray." 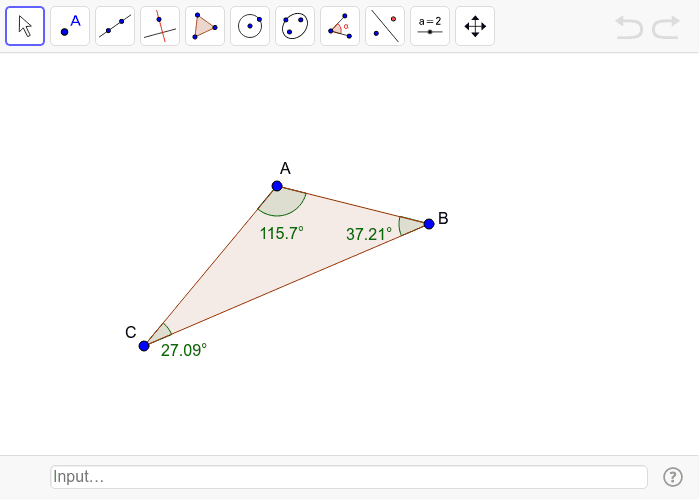 Click on A, then B to form an extension of that side of the triangle. 2) Click on the point tool (2nd square) and choose "Point on Object." Click anywhere outside the triangle on the ray you just created. 3) Find the measure of the exterior angle formed by clicking on the angle tool (8th square) and choosing "Angle"; then click C, B, and your new point (in that order). 4) Drag any point and make observations about angle measure relationships. Write down your hypothesis. 5) After you think you have made a discovery, click on ray AB to highlight it and hit delete. Create another ray using two different points. Determine if your hypothesis is correct. and the measure of the adjacent, exterior angle? That was too easy. Now, allowing for a bit of rounding error in the hundredths place of the angle measures, write a hypothesis about the relationship between the exterior angle and the two angles that are not adjacent to that angle. Is there a connection between your two observations? If so, what? Compare your thoughts with a neighbor before recording in your notes.